Wood has different strength properties when loaded in different manners. In fact, there are six main design values that are published for lumber and timbers in order for engineers to appropriately design a structure. 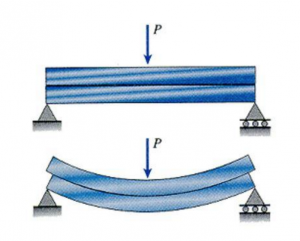 Tension: The fiber stress in tension, Ft, is related to the breaking strength of a piece when loaded in tension. One common application where tensile loads can be critical is in the bottom chord of a roof or floor truss. Compression: Wood strength varies depending on how the load is applied relative to the growth rings of the tree. There are two compression properties of interest. Fc// is a strength value when the piece is loaded parallel to the grain of the piece. This type of loading occurs when wood is used a column, and generally in the top chords of trusses. The second compressive property of interest to engineers is Fc┴, compression when loaded perpendicular to the grain. This, similar to E, is considered a serviceability consideration and the published design values are based on the compressive load required to create 0.04” of crushing. The last primary design property is horizontal shear, or Fv. Shear is the force that makes layers slide against each other, as shown in the following picture. Maximum shear forces occur at the ends of members used as beams. Each size and grade of a species of wood may have different design properties. The design values for Southern Pine are published in the SPIB grading rules as well as in the National Design Specification supplement, published by the American Wood Council (AWC). All of these properties are important for properly designing wood structures. Some structures can be built satisfactorily by using span tables that show the maximum spans for certain members based on how the members are spaced and loaded. More complicated structures require more sophisticated analysis of applied loads. All structures benefit from careful design of the connections that hold the members together.